The benefit of the EU for UK Trade and Industry. the EU. Most articles about the benefits of the EU simply state the growth in trade between the EU and the UK but I will also compare the UK with other countries to show the comparative benefit that the EU has delivered. 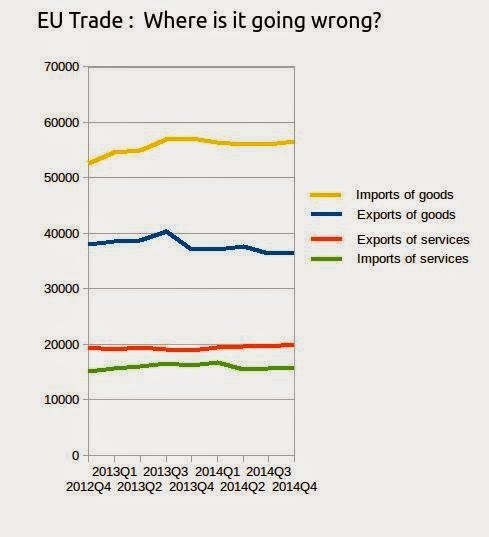 If the EU is beneficial to the UK it should be obvious that UK-EU exports should be growing faster than the exports from other countries in general to the EU. In the table below the growth in trade with the EU since 1993 is compared between countries. It should shock the reader to discover that exports grew less between the UK and the EU than they did between Russia, China or the USA and the EU . All of these countries are not EU members but enjoyed a better export growth with the EU than the UK. Being a member of the EU was not a trading advantage for the UK. 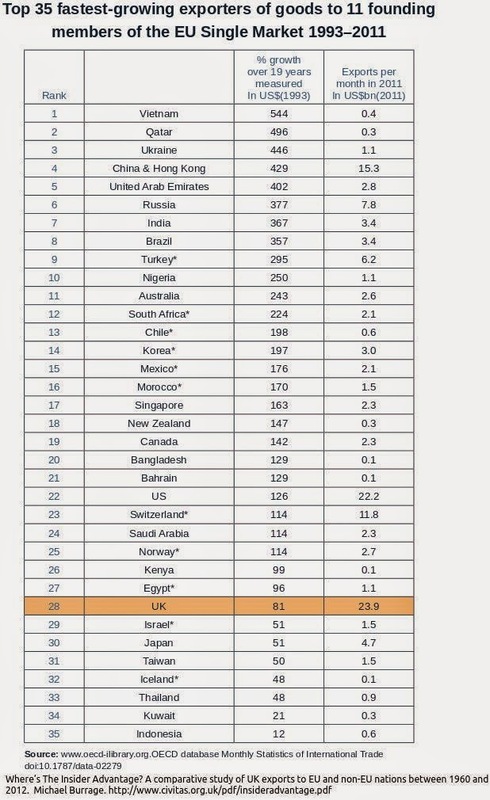 In fact the UK is 28th in terms of export growth with the EU. EU financed pressure groups say how wonderful it is to be in the EU, just look, 81% growth in exports since 1993 but almost all trading nations outside the EU did better than the UK, for instance Canada and New Zealand increased their exports with the EU by over 140% in this period. It is also surprising that the UK did badly in services exports to the EU, being 22nd in the league and notching up only 53% growth. 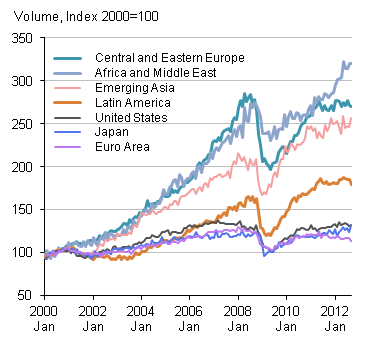 Most of the rest of the world did better than the UK at exporting to Europe from 1993 to 2011. Shaking off the UK’s EU based xenophobia has resulted in more export trade between the UK and non-EU countries than between the EU and the UK in the past 3 years. Something odd is going on here, it is almost as if the UK is being positively disadvantaged by being in the EU. If this is the case then we should see imports from the EU into the UK growing much faster than UK exports to the EU. If being inside the EU is positively damaging the UK we should see an accelerating deficit in trade with the EU compared with trade with other countries. 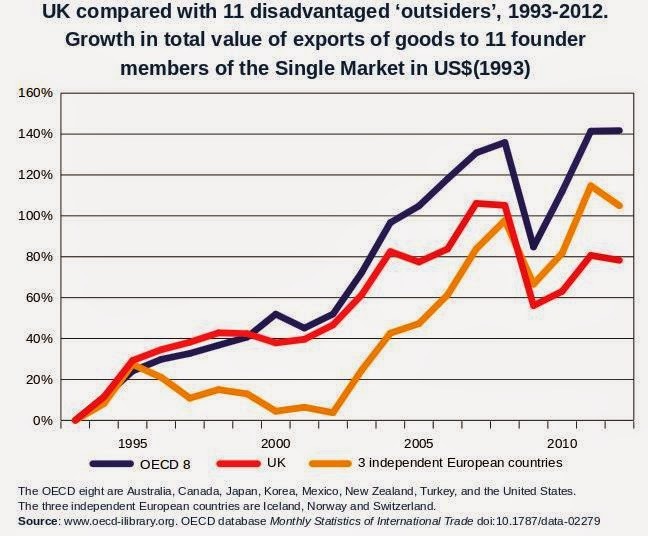 As can be seen from the graph above, there is something about trade with the EU that is positively disadvantageous to the UK (hidden barriers). The UK can trade at a surplus with the rest of the world but there is some factor in the way that the EU “free” market is constructed that is causing huge losses and damaging British interests. 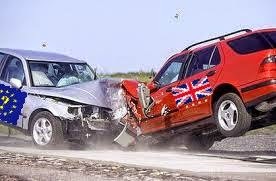 A Quarterly Trade deficit of over £15,000 million pounds with the EU is a deficit of crisis proportions. The full balance of payments deficit with the EU is even worse, at about £100 billion last year (See Membership of the EU: Pros and Cons). On closer analysis it is the growing deficit in sales of goods and the almost flatlining of service sales to the EU that are causing this large deficit. Most of these EU goods come from Germany which uses a currency that is relatively low in value because Germany does not bear the social costs of the Euro in Southern Europe. A recent study, “Change or Go” has analysed some of the reasons why the UK is doing so badly from its association with the EU. The basic message is that leaving the EU would not hurt our exporters at all, Europe does not have very high trade tariffs against the rest of the world – as would be expected from the success of countries like Canada and China at exporting to Europe. There would be no massive barriers to exporting to the EU if the UK left the union. “Change or Go” is summarized in the Daily Telegraph article: Why Leaving the EU would not be a Disaster for the UK’s Exporters. It says that inside the EU: “The UK currently spends a net £11.3bn for the privilege of being a member of the EU and obtaining (mostly) tariff-free access to 56 markets. Outside, in the Worst Case Scenario, access to those same 56 markets would cost £7.4bn.”. It also exposes why it is easy to get a few prominent businessmen to avidly support the case for the EU when the statistics say the opposite: “Businesses responsible for less than 5pc of Britain’s exports to the whole world bear nearly three-quarters of the cost [of leaving the EU], a degree of concentration that would allow targeted government assistance to be delivered to those most affected.”. 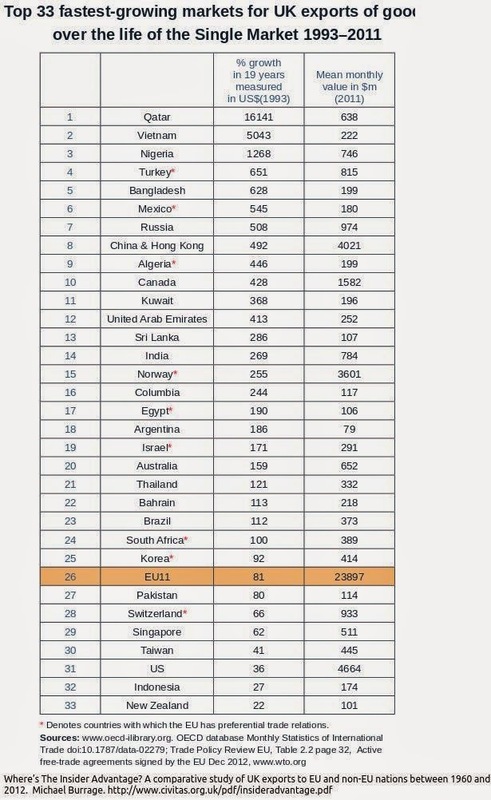 What Change or Go does not emphasize is that many non-EU countries pay almost no tariffs at all to the EU; Canadians export whiskey duty free and a Japan-EU Free Trade Agreement is about to be finalized so that Nissan can export directly – see The Great Myth of EU Tariffs. 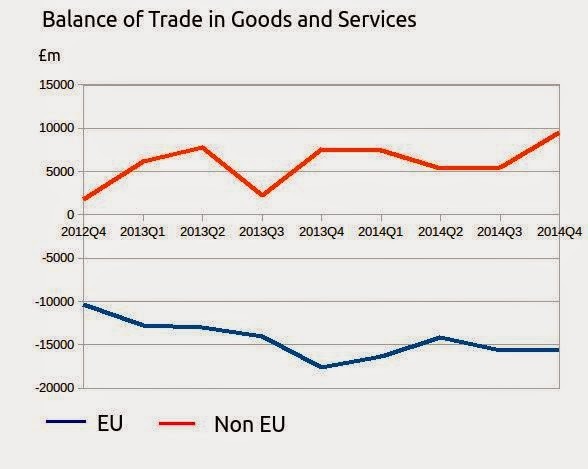 In conclusion it can be said that membership of the EU is a serious disadvantage for UK Trade and Industry and it is leading to a huge balance of trade deficit. Where’s The Insider Advantage? 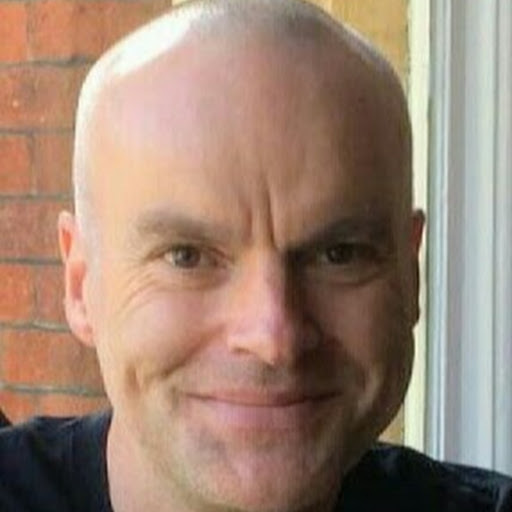 Michael Burrage, 2012. With all due respect this is only looking at part of the whole. Industry is only a tiny part of UK earnings. Our biggest earner is our ownership of parts of other nations through ‘mortgage’. The interest we get on loans is effectively a tribute in economic rent. Yes, when you consider the whole balance of payments the deficit is over £100 billion per annum. Totally disastrous.